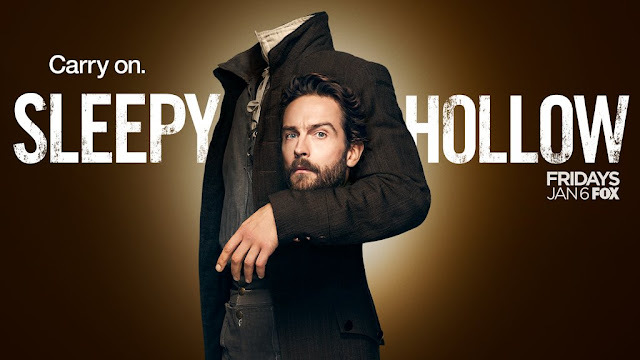 We see Ichabod completely moving to DC now, moving into the new home with the help of Jenny and Jake, his new neighbour – selected because it is cheap and has anyone actually figured out where Ichabod gets his money from? This is the theme of this episode (hah, this season!) there’s a lot I’d like here which would be so much better if Abbie were here and/or Abbie’s death didn’t permeate everything like a terrible stench. Every little scene – like this house hunting – would just be that much better with Abbie’s input, her eye rolls, her asides with Jenny, her bouncing of Ichabod. The whole show feels like a rip off of what it was without her being present. That core is missing and it shows, I can feel the void. Jake is also crushing on Jenny. Jenny is not interested. This would be better with Abbie and Jenny able to joke about this. What gets me especially is they’re moving house, setting up a new team and… it’s rebooted. It’s the third episode and we’ve pretty much started out all over again now. The new team’s established, Ichabod’s new relationships are in place, his new home is set up, the basic conflicts and antagonists are being laid out. But this is episode 3. Three! That’s too soon – where’s the grief, the horror? Sure I can smell the stench of Abbie’s absence – but where’s the shadow of it? Jenny and Ichabod are right there – why aren’t they still grieving? Why isn’t Abbie a constant presence in their minds, speeches, every thought and action? Abbie was a major part of their lives, her presence should still be being felt and I think this episode was absent because it wasn’t. And, yes, I did see a Black female president which would be great if she actually had a line. The Horseman is stopped from his head chopping by bright light from the sewers. This is also how NotAbbie Diana draws Ichabod into the case – obvious supernatural creature attacks the president, then Diana, the homeland security agent who knows about magic (because despite EVERY founding father, every last one, being virtual grand warlocks, absolutely none of that knowledge continued down the ages, it seems. Do we need to talk about this? I mean, how does this even happen? The Founding fathers and all their special followers were all woo-woo masters fighting a revolution which was all about demons and magic – but 2 centuries or so later and no-one remembers? They didn’t think it was worth noting). They investigate the sewers with the supernatural light using Jake and Alex’s expertise – and I will give the show this, they did a very good job of quickly integrating these two and drawing on their skills and also developing some level of rapport with Jenny so they’re not just all relating to Ichabod. And it would be much better if they also did that with Abbie – the rapid formation of a group really does reinforce the idea that this is a reboot. In the sewers they find glyphs and symbols from a variety of ancient cultures all combined to be a super ward. This leads them to the work of Benjamin Banneker one of Jake’s heroes and a Black man in Revolutionary America with some very sharp things to say about slavery. And my gods this characters was needed several seasons ago to call out the whole uncritical Founder worship that has been such a hallmark of this series. Thank you for finally having someone point out how selective all of Ichabod’s speeches on “freedom” and “oppression” are, how hollow they are to a Black man who is viewed and property either way. How the great heroes of freedom Ichabod continually praises, owned slaves and continued slavery. My gods it’s about time this was addressed. I could do without Ichabod randomly running into this man and then presuming to instruct him on the path to freedom (which seemed less about calling out racism so much as making it clear Ichabod may be a product of the 18th century but he totally wasn’t a racist). I can see why they accepted it because they’ve already accepted so much supernatural. But I still have the feel that this quickly bringing everyone into the big secret and having everyone accept it so quickly again adds to the reboot feel of this season. We’re not transitioning from the last season – we’re establishing a new reality as quickly as possible. Diana is furious that Ichabod didn’t do a full disclosure before this – which I can kind of see. But, at the same time, did she honestly think she – or anyone – would be in a position to hear this? Really? Hear it and accept it and believe it? I’m the first to say I am so tired of secrecy for secrecy’s sake or protecting people (especially women) by mushrooming them but in this case? I can see the reason for secrecy here. And with this knowledge, Ichabod and the whole team (and I’ll give it points that this episode does involve the whole team) do manage to trap the horseman down this street. And when trapped, that allows Malcolm to make an evil deal with said horseman and recruit him on side. Still team good guy is considering this a victory – but there’s a definite rift. Not!Abbie Diana has looked through daughter Molly’s sketch book and seen pictures drawn as if from Abbie’s point of view. She learns her daughter is the new Witness and quickly responds with NO NO NO NOOOOOOO get away from my daughter!!!! She’s going to take some time to get onside.